Let’s analyze each of the 10 listed violations by number of citations and the section of OSHA 29 CFR that covers requirements and standards for each. We’ll offer some ideas for ways to improve safety in these areas. This covers examination, installation, and the correct use of equipment, as well as assuring equipment is safe for use. Safety training is an important element for compliance with this standard. Machine guarding is one of the best ways to prevent injuries around equipment with moving parts that workers may come in contact with. This includes the point of operation risk of exposure to injury as well as general worker injury risks. Compliance standards include metal raceways, cable trays, cable armor and sheath, enclosures, frames and more. Also covers electrical noise reduction, wiring standards and limitations. People tend to disregard ladder use hazards and that is exactly what gets them in trouble. To keep your workers safer, insist on safety training and then enforce the rules. 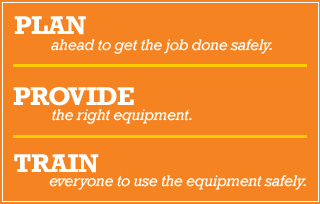 OSHA standards address load capacity, step surfaces, clearances, ladder cages, and even step stools. Equipment included are fork trucks, tractors, platform lift trucks, motorized hand trucks and more. Standards are listed for design and construction as well as testing lab approvals. An important issue here beyond making sure equipment is in proper working order is training users in safe practices and making sure locations where pedestrians and industrial trucks share space is adequately protected against collisions. We extensively cover ways to help make people safer when forklifts operate near and around pedestrians. See this series of blog articles for extensive information. OSHA’s title for this section of 29 CFR is strong reason for paying attention to lockout/tagout methods: “The control of hazardous energy”. Death and serious injuries by electrocution is sudden, violent, and needless. Make sure your facility and contractors have the right lockout/tagout equipment to keep maintenance and repair jobs safe for everyone. Part of PPE (personal protection equipment), respiratory protection should always be considered when dealing with confined spaces, hazardous materials, or contaminated air laden with debris or fine particulates. Coming in at top violation type with more than 1,500 citations over the next closest violation type, fall protection is not just a construction concern. 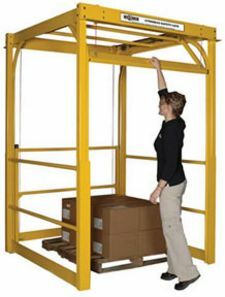 Falls in material handling happen all too often although there are ample ways to help prevent falls. Guard rail, handrail, mezzanine gates, caged ladders, hatch and skylight protectors, and the list goes on. See “Elevated Platforms and Fall Protection” for more information. What all these citations come down to is the failure to implement sufficient safety equipment and/or training at a job site. 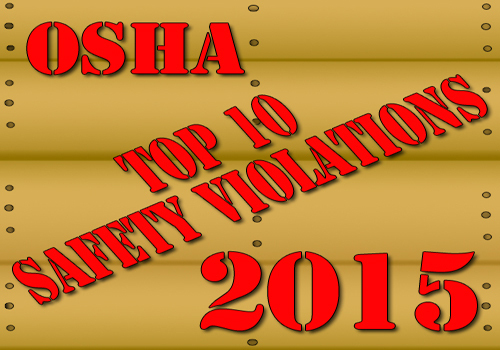 These citations also offer clear warning of what is catching OSHA’s eye when inspecting a site. If others are lacking in safety precautions, you may need to sharpen your safety program, too. Take a little time to read the regulations and evaluate how well you meet the standards.